Looking ahead already to the 2010-11, the University of California Board of Regents are preparing to face another fiscal year of budget shortfalls, according to a UC Newsroom release. The current budget gap of $535 million for the 2009-10 year "could grow to more than $600 million in the next fiscal year," and that has the UC looking for any and all ways to curb the shortfall. How does the budget break down into haves and have nots? This budget shortfall consists of $368 million in mandatory costs that the state was unable to fund and unprecedented state budget cuts of $814 million in 2008-09 and $637 million in 2009-10. The mandatory costs stem from unfunded enrollments, inflation, utility costs and health benefits cost increases, as well as collective bargaining agreements. Because things aren&apos;t expected to get any better before they get worse, the administration has "asked the Regents to consider enacting a mid-year fee increase in 2009-10 and fee increases for 2010-11, as part of a series of new and ongoing measures to close UC&apos;s budget gap." While some of the funds would go towards financial aid, UC President Mark G. Yudof notes that California is providing decreasing support for higher ed students: "The state now funds each student by about half of what it did only two decades ago." 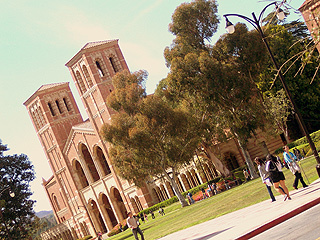 Yudof hopes to reassure current and future students that the UC remains committed to excellence amidst the financial hardship; in addition to higher student fees the system is working to save money via instructional budget reductions, layoffs, eliminating positions, and waiting to fill vacant positions. The proposed mid-year increase to take effect in Spring 2010 would see tuition rise to $585 for resident undergraduates, and between $579 and $654 for resident graduate students (for the remainder of the year) and for 2010-11 tuition would rise to $1,344 for resident undergraduates, and between $1,332 and $1,506 for resident graduate students (for the full year).